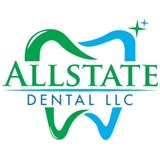 ALLSTATE DENTAL ,LLC (Newark) - Book Appointment Online! I found Dr.Luba on Zocdoc and I went in for my first appointment not expecting much. But, honestly she’s the best dentist I ever had. She’s very nice as well as her staff. She took pictures of my teeth and showed me what was going in there. I felt very involved because she wasn’t just telling me about my teeth, but she also showed me. I told the staff that this is a “fancy” dentist because she did that lol. Overall I really enjoyed my experience and I will continue to go to her. I recommend her a thousands times!